Well, the stilted sounding dialogue seemed, to me at least, to be kinda the point, drawing attention to the artificiality of the whole thing - this is, after all, a hyper-stylized world right out of a Mickey Spillane novel. I think that some actors did a better job with the dialogue than others. Clive Owen and Mickey Rourke, for example, fared very well, while Michael Madsen, not so much, but I think that it is more to do with the strengths and limitations of various actors in the cast. Put me squarely in J.D. 's camp, seeing as how I agree that Sin City is an ambitious attempt to pay simultaneous homage to both the film noir genre and the graphic novel medium. Some of the noir elements are diluted by the time the story reaches the screen, in part because this is a filmed adaptation of a medium that was already adapting a film genre. Post-modernism at its best, no? And J.D. makes a good point. However I feel about the film, he is correct in saying that some actors, Jessica Alba and Michael Madsen in particular, did not serve the material well under the constraints of the screenplay. But does the artifice of the film undermine its value? Film is an inherently artificial medium, and isn't anything put before the lens already influenced unnaturally by the very presence of the camera? So you can see why the argument that a film lacks substance or reality, holds little water with me. Sure, it is a Hollywood blockbuster, but it is hardly a trifle in film history. It is a significant homage to an often neglected genre, the Saturday morning serial. It is near flawless in its execution as an action-adventure film. As a suspense thriller, though it may be forgotten after repeated viewings, it rivals the work of Hitchcock (especially in the how-did-he-film-that department). And it doesn't fall prey to the trite dialogue, or wooden characterizations routinely found even in the original Star Wars trilogy. Tony, Raiders is undoubtedly a great action-adventure flick. To me, though, the Hitchcock comparison is more revelatory for the differences than the similarities. Hitch was a sublime craftsman with an unrivaled technical mastery, but this formal acumen was rarely used only in service to the suspense or the action. There is invariably something deeper, something of substance, going on in Hitch's best films, whether it's the depth of the characterization, the thematic and psychological subtexts, or, as in Psycho and North By Northwest, a certain playfulness with the formal conventions of genres. As good as Hitchcock was at entertaining, I think he was always conscious of making his films interesting beneath the surface as well. Raiders is all surface. I enjoy it, and I'm certainly not judging it negatively for its popularity, but there's just nothing there beyond a fun adventure. To the extent that the Indiana Jones films have any substance at all, it's in the form of a regressive Orientalism that shows through much more clearly in Temple of Doom but is present in the first film as well. Let's remember that before Cahiers du Cinema first crowned Hitchcock as an auteur he was often dismissed as a genre director in much the same way that Spielberg has been. Thematically, Spielberg has matured in a way that make his particular concerns much more evident in his recent films, concerns such as his fascination with World War II and Nazi Germany. This theme is treated in a much more adolescent way in his earlier films, 1941 (1979) and Raiders in particular, which were fed by his childhood "education" through movies. His exploration of the effect of the war, and more specifically the Nazis, on his father's generation matures during the course of his career so that by the time he directs Schindler's List (1993) and Saving Private Ryan (1998), he cannot trivialize Nazi Germany nor America's involvement in the war as he does in his earlier films. Seeing as he could not simply get from there to here without an evolution in his art, there is then a value to Raiders of the Lost Ark that deepens once its place in the broader context of Spielberg's filmography is examined, if only to serve as a contrast to his later films. The fact that the film seems to be "all surface", as Ed puts it, is not necessarily so because of the foundation it initially establishes in his progressively conscious thoughts on WWII. So I'd like to hear from my readers on this. Are entertaining films to be dismissed as lacking any substantive value, or might a viewer glean something deeper from them the same way one can in "pop art"? Tell me about some of the movies that you were surprised to find went deeper than you once might have thought. Or tell me why such movies should correctly be viewed as simplistic or superficial. What a fascinating subject matter! I don't feel like, at this moment, going through my favorite films to pick out the ones that adhere to this template. However, let me pick out one recent movie that I think illustrates my feelings. TROPIC THUNDER, is at first glance, a stupid movie for undemanding people. However, upon a deeper glance, it's not a movie about dumbkofs on a movie set. Instead, it's an immensely knowledgeable film about how BAD modern movies have become, thanks to the contributions of every one from key grips to studio execs. I recently watched TT expecting nothing but a few gags. What I got was so much deeper...and thus this makes it the perfect example of what you are calling for: a crowd-pleasing trifle that somehow has something more meaningful to say. The fact is, one can find examples of this everywhere: JAWS is not just a movie about a shark, it's a movie about man vs. nature. TITANIC, in its (very few) best moments, is not a movie about a doomed romance; it's about the danger of believing in humanity's power against the elements. TOY STORY is not a movie about prescient playthings, but about the thorny business of growing up. PULP FICTION is not so concerned with its intricate plot machinations as it is with the notion of loyalty and morality, even in its crime-ridden world. These are only four examples off the top of my head. But I assure you I could find something that resonates with the public conciousness in almost every moview that worms its way into the canon, regardless of its box-office take. The fact is, movies speak to people. By their very nature, they do so. The movies that people remember, time and time again, are the movies that REALLY had something to say to us as humans. You may reply "Well, LARA CROFT made 200 million or whatever...what did that have to say to us?" Answer: nothing. That's why you don't hear anyone talking about LARA CROFT anymore. And you won't hear anyone talking about it or some finacially successful movies as vapid as it is for the next 100 years. The cream, as always, rises to the top. Always remember that, D.
First off, Thanks for the mention and the link to Moon in the Gutter. I have posted a link to your article over there as well. "Are entertaining films to be dismissed as lacking any substantive value, or might a viewer glean something deeper from them the same way one can in "pop art"? Tell me about some of the movies that you were surprised to find went deeper than you once might have thought. Or tell me why such movies should correctly be viewed as simplistic or superficial." Sometimes the substance is the style and filmgoers who ignore that fact or pass certain works off as shallow are missing some of the most memorable films around. Many of my favorite filmmakers from De Palma to Beineix to Argento to Besson have been accused of substituting style over substance, but in their best works their is a real undercurrent of emotion and depth that plays directly to their undeniably great visuals. De Palma's Blow Out is one of my favorite examples. Here is a movie over-flowing with style and artifice but for those willing to dig deeper they will find one of the most interesting comments on post-Watergate paranoia in all of American cinema and, on top of that, a truly moving and human story about a man who is destroyed by his inability to save the people he cares about the most. Plus the film, like many of De Palma's works, is an audacious celebration of cinema. Some of my favorite films have been accused of being seemingly all style over substance, but I typically find that by digging a bit deeper and rewatching films like Diva, Deep Red or Subway, one can really get a lot more out of them than just the obvious cinematic flair and flash that is obviously apparent. Since I'm quoted here, I ought to clarify my position, which was not to oppose "style" and "substance" but to fault Robert Rodriguez for an adaptation that arguably did a disservice to Frank Miller by neglecting to translate comic-book dialogue into cinematic dialogue. I don't think that neglect can be justified as "style" but it might be written off as an experiment in form. In any event, my deeper problem with SIN CITY is with the source material, the specific later work of Frank Miller, rather than any hostility to the genre he works in. If I can admire and defend PLANET TERROR, then my problem obviously isn't with the type of movies Rodriguez makes or his sylistic approach to them. One worked for me, the other didn't. Otherwise, I'm on the same side as the rest of you. Thank you for your insightful comments. I doubt anyone would argue with you about the core meanings of any of the films you mentioned. But I should clarify that what I specifically refer to is the dismissal of certain films as lacking substantive artistic, philosophical, or political value because of their popularity. Lara Croft is a good example of a movie that is obviously derivative of Raiders yet has none of the depth, artistically or otherwise of its antecedent. Good point about the directors you listed. And De Palma being someone whose films I am well versed in, I'd like to point out something you might agree with me on. When he's at his best, he is definitely working on multiple levels, Blow Out being the most obvious example, but Carlito's Way being a more subtle execution of the same sense of intelligence at work, as it seems to work in tandem with his earlier work on Scarface on a "call and response" level. That is art. Welcome to the site, and I especially appreciate your comments here. While your comments at Jeremy's site started the ball rolling, by no means were they what got me incensed enough to write this post. I can understand if not agree with your assessment on Sin City since the film's inconsistencies glaringly illustrate the obvious difficulty with buying into the hard-boiled dialogue. In other words, if it had been flawlessly executed, I doubt we'd be having this conversation. I would not argue for Hitchcock's technical mastery if we are talking special effects. His rear-projection is cringingly godawful even by the standards of the time. He didn't care so much about effects. What lures the audience in a Hitchcock film, I would argue, is his unrivaled ability to put the pieces of the scene together in exactly the way that will keep you enthralled, to the point where you won't care about the rear-projection. And his best movies have great psychological depth. Okay, that aside. Broken record here, but I always say that realism is just another style. Stilted dialogue does not make a bad movie, necessarily. The movies are a visual medium and style is its own type of worth, which is why certain movies from the periods I cover still enchant even if attempts to analyze their themes have limited results. But all movies have underlying themes, no movie is literally all style--or at least I can't think of any. The question is, do the themes have resonance? or are they puerile and trite? If the themes are dull, cliched, or objectionable, are they pushed far enough behind the style for you to ignore them comfortably? For me to cotton to a movie that ultimately seems to be style over substance, it has to be a style that I personally find beautiful or amusing--certain musicals would be an example, like Cover Girl, which just prompted a good discussion at David Cairns' place. Otherwise something like Pulp Fiction, which flashed a lot of verbal and visual cinematic influences without having much underneath, isn't going to win me over even if I admire the expertise. That's simply because I found the style itself to be arresting at times, but aggressively ugly and even adolescent at other times. Thank you for bringing your unique perspective to the comments. You are correct in pointing out Hitchcock's deficiencies in the effects category. I'd like to think that sometimes his rear-projection deficiencies were deliberate. They certainly call attention to themselves in his movies. And the artifice of his set in Rear Window also kind of makes my point for me. Critics at the time certainly got lost in the gloss of Hitch's movies, but they have proven to be deeper than first thought over time. You expressed my sentiments exactly in the rest of your response. What some may call stilted dialogue or performances, I call mannered, especially if I feel there is a point or an intelligence behind it. And the essence of what is being explained here is not only if something has resonance, but is there a point to the artifice that goes beyond simple flashy look-what-I-can-do (unless that is the point, as in De Palma's shamelessly manipulative Raising Cain a big gotcha at viewers that is anything but mean-spirited towards them). Pulp Fiction is a great example. What IS the point of the nonlinear approach beyond look-what-I-can-do? Sure the movie has great dialogue, wonderful performances, but the nonlinear storytelling seemed to be present simply to screw with the audience. Jackie Brown, is a more mature work, where Tarantino still plays with time but only in order to serve the story and one's appreciation of the film. Tony, that's a very interesting post. To answer one of your questions: "Are entertaining films to be dismissed as lacking any substantive value, or might a viewer glean something deeper from them the same way one can in "pop art"?" I don't think there's any general rule to be formed from this, other than that in a truly great filmmaker, style and substance are inseparable. That's certainly the case for Hitchcock; even in the cases when his style might be accused of being amateurish or his effects awkward, he's often creating an intended effect. To cite one example already mentioned here, his use of obviously fake rear projection and matte painting is used in Marnie to create a very stylized, artificially empty world that puts the emphasis squarely on the psychology of the title heroine. No one would call Hitch an effects wizard, and his effects of this sort are definitely of their time, but he always achieved exactly what he wanted with them. Pulp Fiction is another fine, and more recent, example of style in the service of substance: the film's genre pastiche and chronological fracturing goes beyond mere artifice to create poignant arcs for the characters and to explore the thematic and emotional undercurrents of these archetypal stories. There's a lot more going on in Tarantino's films than some people, dazzled by his style, are willing or able to see. That said, to get back to the original example that prompted some of your comments, I'd like to see someone make a defense of the stylistic choices in Raiders along the same lines. I'm not sure such a defense can be made, and citing later Spielberg films that also feature Nazis isn't exactly what I had in mind. My point is that while stylists like Hitchcock and Tarantino use style as an extension or expression of the substance in their films, Raiders is largely a substanceless adventure. I enjoy the film, but I don't think it has the conjunction of style and substance that I deem necessary to a truly great work of art. "...I'd like to see someone make a defense of the stylistic choices in Raiders along the same lines. I'm not sure such a defense can be made, and citing later Spielberg films that also feature Nazis isn't exactly what I had in mind." It may not be what you had in mind, but it does not invalidate the argument I'm making. Roger Ebert argues (much better than I ever could) the same point in this review written in 2000. So it would seem I'm onto something. "Pulp Fiction is another fine, and more recent, example of style in the service of substance: the film's genre pastiche and chronological fracturing goes beyond mere artifice to create poignant arcs for the characters and to explore the thematic and emotional undercurrents of these archetypal stories. There's a lot more going on in Tarantino's films than some people, dazzled by his style, are willing or able to see. I don't disagree with you in the case of Tarantino as a whole. But in regards to Pulp Fiction in particular I ask again as I did in earlier comments, what IS the point of the nonlinear approach beyond look-what-I-can-do? How is any character's arc more poignant because of the chronological fracturing? All it did for me was drive home the fact that every time Vincent Vega goes to the john he comes out to a worse situation than the one he was in before he went. Is there a specific reason, in service of the story or themes, he did this fracturing instead of sticking with linear storytelling? If not, then is he simply showboating? Ebert is convincing and articulate as always, but I think he's reading in a lot more than is actually in the movie, based on his later knowledge of Spielberg. Anyway, as for Pulp Fiction, I've seen the film many times but it's been a few years now, so my apologies if my details are not exactly on target. To me, the structure primarily resonates in its implications for Jules and Vincent. Tarantino uses the structure to make Vincent come back to life after being killed, making his appearances in the latter half of the film have more weight than if it had been structured chronologically and he simply died. This is especially true since one of the key scenes in this portion of the film is the one where Jules explains to Vincent why he has decided to quit this life -- he wants to go "walk the earth" instead, like David Carradine in Kung Fu. The chronology causes Jules to be absent in earlier sequences of the film, in which Vincent has a different partner, though we don't realize why this is until the ending, when Jules says he's quitting. If these scenes were in the proper order, everything would play out much differently: Jules would say he was leaving, then Vincent would do some missions with his new partner and be killed. The way Tarantino structured things, by the end of the film we know how things will turn out for Vincent, and Jules' speech takes on a new poignancy: we know that if he was able to get through to Vincent, he might save his partner's life, but we also know that Vincent will not listen, and will soon be dead, while Jules will go off into unseen other adventures and possibly a better life. One of the film's key themes is the possibility of redemption and starting over, and the chronology allows Tarantino to highlight this theme with regard to those two characters. 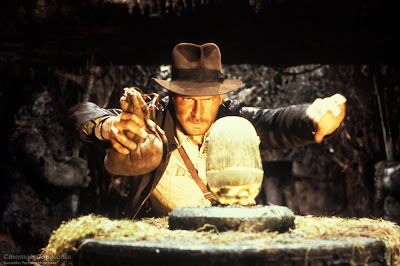 In the case of RAIDERS OF THE LOST ARK, I think that what makes it such a great film and one that has endured over the years is that it works on multiple levels. It is a wonderful thrill-ride but I think that there is also some very rich characterization going on, here. In between, the exciting action sequences is all of this great subtext between Indy and Marion and how they had a love affair years ago but he broke her heart. This past, which is only hinted at and alluded to briefly, informs how they treat each other in the film. It also makes their characters that much more compelling. Same holds true for the rivalry between Indy and Belloq. Again, the film hints that these two have a long past, competing for the same relics that finally comes to a head in this film. This backstory makes their relationship that much more interesting and raises the stakes higher in Indy's quest for the Ark. While I love the other films in the series, they lack this kind of depth (for lack of a better word) and I think this is due in large part to Lawrence Kasdan's fantastic script for RAIDERS. And, to top it all off, there are all kinds of wonderful homages to pulp serials from the '30 and '40s in RAIDERS but never too much to distract you from the film at hand and you never feel like the film is merely a collection of bits and pieces quoted from other films. It is strong enough to stand on its own and actually create its own mythology. 1. In Pulp Fiction, the fact that the film begins and ends with the same scene also drives home the circularity and repetition of these kinds of pulpy genre stories; the characters are trapped in a loop from which some, like Jules, will escape, while others like Vincent will simply follow the circle blindly until they die. The scene also plays out first as straight up action, and then the second time we see it, Tarantino instead lingers on the conversation between Jules and Vincent, which draws out the thematic subtexts I already mentioned. 2. In regards to Ebert on Raiders, even his defense of the film's substance essentially amounts to: Spielberg hates Nazis, and wants to stick it to them with boyish glee. Well, yea. Way to go, Spielberg, sticking it to those Nazis in 1981. I'd argue if the substance of your film amounts to "Nazis are bad," and it was made after, say, 1950 or so, then it's about as timely and relevant as the use of Cold War-era Soviets as the villains in the latest Indy flick. Considering all the substantial and complex films that have been made about the Nazis and the Holocaust -- not least of which is Paul Verhoeven's morally ambiguous and largely overlooked Black Book, which also plays out as an adventure flick on its surface -- I don't think it's worth pumping up an essentially fluffy, fun adventure flick like Raiders just because its villains are Nazis. Tony, this is a great post. I'm anticipating a round-up of other bloggers' work (along with some highlights of my own blog) for a final post of the year, after Christmas of course. This will definitely be high up on the list as a selection from your own blog - very compelling ideas. So much so that you can consider this a placeholder comment - I will return and collect my thoughts because there's so much to discuss here. Especially since I seem to disagree with you on Sin City, which I didn't like and did think stilted, and agree with you on Raiders, which I think probably can be considered a masterpiece - and your point on Hitchcock is well-taken, another point I agree with (especially in relation to something like North by Northwest, which I always put more in the Hitch-as-entertainer category than something like Vertigo). Ed, I stand corrected on Pulp Fiction. You make a good case as to why he felt his nonlinear approach would serve the themes of his film. I wonder, though if that wasn't done to fog up what would have been the obvious fate of Vincent Vega had the film been presented chronologically. Simple foreshadowing could have delivered the same effect. My point is the movie felt film-geekily gimmicky. That is a charge that is difficult to level at Raiders despite your decision to dig your heels in against the film. It is clear that Ebert didn't read too much into the film. The inhumanity of the Nazis is a recurring theme in Spielberg's films and can be used as a benchmark of his personal and professional maturity. In 1941 they are simply bumbling fools reminiscent of war comedies he might have seen growing up. They grow more fearsome in Raiders yet there is a lack of emotional complexity in their persona. But even in Indiana Jones and the Last Crusade a much more superficial film a glimmer of his changing opinion on Nzis is gleaned from the book-burning scene in which Indy runs into Hitler. By the time we reach Schindler's List it is clear that Spielberg has moved a far distance in his depiction of the Nazis, showing a multilayered society in which Oskar Schindler can be both greedy and heroic, while Amon Goeth can be both a banal charmer and monstrously evil. Don't get me wrong, I don't mean to pump up a fun adventure like Raiders to the level of Schindler's List. My point is simply that there is more to it than just the trifle you label it as. And density in a film's serious quotient should not be the only measuring stick applied to its artistic and cultural significance. Welcome to the site and thanks for your thoughts. I agree with most of them so there's not much here for me to add. Thanks for the lively debate. I'm gratified that you've made some good points in the spirit of healthy discussion. As usual I look forward to your insight, and will check out your post. I've always thought the established hierarchy of film went vertically (and sort of unfairly) like this: 1) tremendous substance with tremendous style; 2) tremendous substance with moderate-to-limited style; 3) moderate-to-limited substance with tremendous style; 4) moderate-to-limited substance with moderate-to-limited style, with each being ranked from 1 to 4 with 1 being most desirable and 4 being least desirable. The better way would be spreading films across a horizontal plane that allowed each to be included, categorized, and organized within their own section instead of being forced to compete against each other despite their inherent dissimilarities. No doubt that 1 would be the most valued in both horizontal and vertical planes to people who love to fall in love with cinema; we desire the intellectual stimulation that substance brings and visual pleasure style brings, and in the best of films, how the two intermingle and each simultaneously enriches the other. I'm not going to try to argue the substantial merits of Raiders of the Lost Ark, although I'm absolutely sure they exist; I tend to agree with Roger Ebert that the film does seem intent on sticking it to the Nazis, which, yes, seems remarkably safe for 1981 – but "safety" and "entertainment" aren't divorced from each other, and even if Raiders isn't making a courageous political statement, the deftness with which Spielberg seems to eviscerate visually the symbols of the Nazi Party is style that is substantial. But most importantly, I think the film succeeds on not only its stylistic flourishes (and intentional homages) but on fundamental narrative levels: it is tightly wound and fully realized in a way that many so-called "substantial films" aren't. Those films that seem substantial get lost to the ages, but Raiders continues to please beyond the limitations of time (a feat it could have accomplished even without blockbuster status). In a horizontal plane system of thinking about films, regardless of the category you'd place Raiders into – category 1 or category 3 – I think it nonetheless rises to the top. It can therefore be judged accordingly in either category, without the need of forcefully comparing it to movies it has nothing in common with besides the medium of film. Sorry I took so long to respond, but I was pretty busy over the holidays. Thanks for posting a link at your site, also. You make a good point, that actually illustrates what I was trying to say. Your hierarchy of films is something that I believe all of us use, in an unspoken manner, to critique films. 1) I have a fifth category for films that are so fantastic that it's hard to analyze them or qualify with any of the other categories you mentioned. These are transcedental experiences that truly make you forget you are watching a film. My experiences, as well as those Of many others I suspect, of watching Lawrence of Arabia or The Conformist are good examples. 2) I think depending on what your philosophy on film is, you may put the third category above the second category in your personal hierarchy. I suspect that Ed subscribes to your order in the hierarchy, while I subscribe to the one I just spoke of. This may be where our fundamental disagreement lies. For me the visuals are always prioritized over any "substance" (I use quotes because in this argument, I believe the word "substance" is an umbrella code for anything thematic or non-aesthetic, even though visuals can be substantive), because film is inherently a visual medium, as opposed to the written word or radio. Silents are the epitome of this philosophy. Tony, an excellent post and discussion. Like your travels around the blogosphere brought multiple ideas into this cohesive post, so does this post tie in with two discussions/thoughts I've been involved with lately. The first is the unending (and perhaps not capable of ending) debate over the distinction of "best" films and "favorite" films. Though I don't think that thought was in mind when Ed made his statement about Raiders not being "list material," I can see it certainly shining. To dismiss Raiders based on a perceived lack of substance seems a disservice not only to the film but to all works of pop art. Basically, unless your film has abundant substance, it can never achieve greatness? Chuck Klosterman would have a field day with that thesis, methinks. Second, I've kind of had the same style/substance debate in my head over biopics. Having recently seen (and enjoyed) Frost/Nixon (and Milk, amongst others), I couldn't help but be stricken with the thought that their overall lack of style hurt them. It seems as though, in the pursuit of accuracy and esteem, the filmmakers of such films all but throw any sort of panache out the window, leaving us with bland, exchangeable films about IMPORTANT TOPICS. And while we might confer upon them the distinctions of Best Film or Best Actor/Actress, do these films really have much lasting value? Well-made as they are, I'll take the unsubstantial pop art over them any day of the week.